For my first Virtual Vegan Potluck I can’t wait to share a fun and fabulous recipe with you. perfect for the winter season! ‘Oh please, let me have some salad!’ may not be the first words you’d utter in the festive run up to Christmas. There’s chocolates and mince pies, home-made biscuits, party snacks and celebration lunches that need our full attention. And still, particularly during the season of sniffles and colds we all need food that re-vitalises us for the party season ahead. This stunning beetroot salad is bursting with vibrant colours and flavours… a delight for your eyes and tastebuds as well as a welcome boost for your immune system. 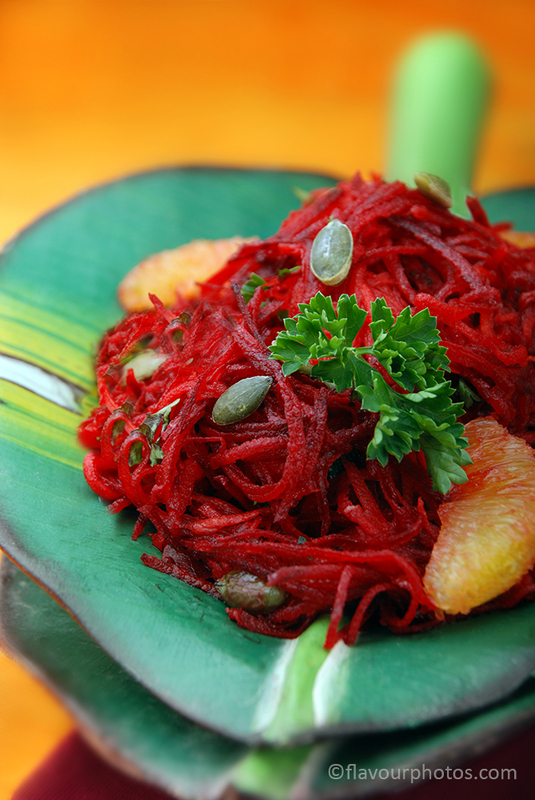 Peel and grate the beetroot, carrot and celeriac and place in a bowl. Toast the pumpkin seeds in a dry pan until they ‘pop’, then add them to the root veg together with the parsley. Peel and finely chop the ginger and stir into the salad. Add the juice and zest of the orange, taking care not to include any pith as this will add a bitter taste. Mix together the oil and vinegar and pour over the salad. Arrange on a plate with some orange segments. Original recipe from Unicorn grocery store for Didsbury Dinners. This post is part of the Virtual Vegan Potluck – an online party for vegan food lovers! Follow the links for more delicious plant-based food. If you are inspired to check out Didsbury Dinners – a fabulous vegan cookbook – you can find out lots more and get a mouth-watering Sticky Toffee Pudding recipe by clicking here. to the next Virtual Vegan Potluck recipe. If your business could benefit from fabulous meat-free recipes and photographs I’d love to hear from you. Thank you very much. It’s a great way to use the earthy beetroot flavour. Thank you so much for doing that Chava ❤️ I hope you enjoy the rest of the recipes! Thank you for stopping by – have a good week. What a difference a plate makes! Stunning salad, Chava! Thanks for coming to the party! I know, isn’t it amazing how much props transform a photo! I love the idea of this salad! Looks super yummy! Looks like a lovely salad to try. It’s nice to try something a bit different and unusual sometimes and the flavours work really well together. Thanks Amy. Those colours are great for a grey day 🙂 Have a good week. Absolutely stunning! I honestly did not know that celeriac could be eaten/is good raw, but it kinda makes sense – I’ll have to try that now! I remember trying a celeriac remoulade in the past which was delicious. Like you, I’d usually think of celeriac as a cooked ingredient but it works really well in this dish. Ha! Cooking with beets is kind of a bloodbath, isn’t it? So messy, but so worth it! Happy belated VVP! Lovely veggie combination! Thank you for the recipe! Looks great Chava. Beetroot, ginger, carrots, orange – what could be better to keep all those viruses away during the week of Nativities & colds! I love the light and flavorful look of this dish–yum!! Fabulous! Love the flavours. I’ve never actually eaten celeriac raw before. I’m gonna have to try. I love a raw beetroot salad, I’d make a beeline for this 🙂 Thanks for bringing it to the VVP! Never want to miss another delicious post? Enter your email address here. I'm a vegan food photographer and cookery writer - my passion and my job for over 11 years now! I'd love to share my experience and knowledge to make this world a happier, more compassionate and kinder place for us all. Cruel is not cool! Clarks, we want vegan kids’ shoes!